Does your agency train you on how to interact with veterans? Is your agency connecting homeless veterans with area service providers? In 2009, CVP developed a State of California-certified veterans awareness training for First Responders. Attendees are taught how to identify and offer assistance to veterans who appear to be in crisis. Over 1,000 First Responders have been trained to date. The First Responder training continues on an appointment basis. 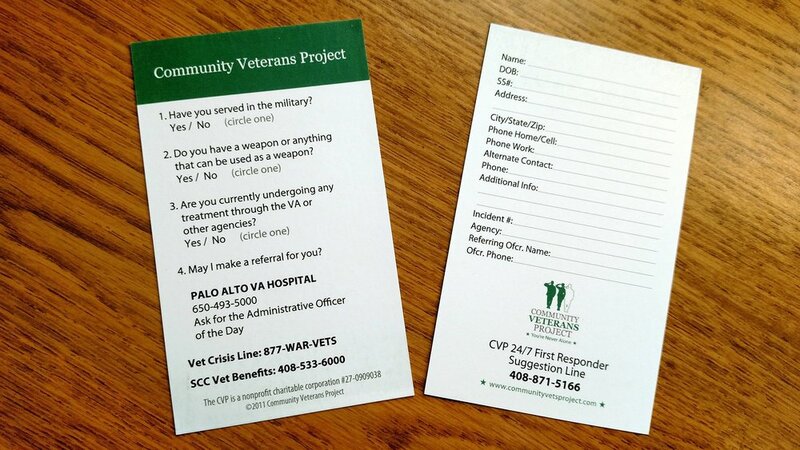 CVP developed and distributes the below "pocket card" to First Responders who attend our training. The Pocket Card is sized to easily fit in the pocket of a uniform shirt. It is a simple, effective method to use when interacting with veterans in the field. Some communities have First Responders who proactively seek out veterans and non-veterans who are in crisis. Is your community ready to develop a program to do the same? If you are interested in learning more about our training that you might be able to offer in your area, email us with your full name, rank, agency, address, and telephone number(s).